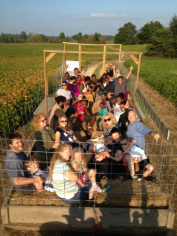 Hayrides are offered hourly on Saturdays and Sundays and on a limited schedule on weekdays. Generally taking 20 minutes, Crawford Farms' hayrides are different than those offered at most other farms. Rather than being used as a shuttle to and from the pumpkin patch, our hayrides are designed as a stand alone attraction. Patrons travel over much of the 215 acre farm in our custom made, fully enclosed trailer that maximizes both safety and visibility. Our journey takes riders through our produce staging area, past a tobacco barn, next to a large pond and through the soybean field. Traveling along grass waterways, we go under a large walnut tree, down "rollercoaster" hill and often encounter a herd of cattle in or near the creek on the "Back 40". Sometimes, we are treated to seeing native fauna such as hawks, deer, turkeys and ducks. Loading and unloading is done just outside the Barnyard Marketplace with no steps to traverse and with just a little notice, our trailer becomes wheelchair accessible. Let us know of any special needs and we will do our best to accommodate. Due to topography and the general nature of the hayride, those who are pregnant or who have back or neck injuries, should avoid taking the hayride. Also, infants are not allowed on the hayrides due to bumps and dust that may be encountered. $2 hayride tickets can be purchased at the farm. Rides run every hour starting at 11 am on Saturday and 1 pm on Sunday. Weekday hayrides are offered at 6 pm. If demand warrants, additional runs will be conducted assuming adequate staff are on hand. Inclement weather or mechanical breakdowns may result in hayrides being cancelled or postponed. During local Fall Breaks (Oct. 1-5), hayrides will begin at 1pm on weekdays and continue throughout the afternoon as demand warrants.